Different stores and other enterprises are accepting cryptocurrency payments to increase their sales or just let cryptocurrency enthusiast pay with cryptos. 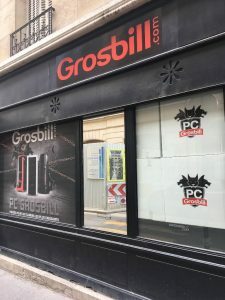 Grosbill, one of the most important French computer stores, now accepts Ether as a means of Payment. At the moment, the company is just accepting Ether, but in the future it can start accepting other cryptocurrencies. The information has been released on Twitter by Grosbill official account. Le paiement en Ethereum sur Grosbill, c'est pour bientôt. Of course, several Twitter users started to ask for other cryptocurrencies like Nano, Bitcoin or Ripple. Apparently, the company has decided to accept Ether due to the fact that its competitors do not accept it. Instead, they accept Bitcoin, that in the past months has been suffering from high fees (something that is changing now). In this way, they will be one of the first tech shops that will accept Ether as a payment option. Ethereum is slightly different to Bitcoin. The network is used for developers to create dapps and other applications. At the same time, Ether works as the natural cryptocurrency of the environment connecting developers and users all over the world. Ether could have been chosen due to the fact that it has low fees and the transaction takes place in just some seconds, compared to Bitcoin. But some time ago, Ethereum faced several problems with its network due to the congestion caused by cryptokitties. Cryptokitties, as we wrote in the past, is an Ethereum-based digital game that has created fans all over the world that buy and sell kitty cards for ETH. At the moment, the most expensive transaction was when someone bought a cat with ID 18 for 253 ETH. The purchase has been made on December the 12th, 2017, and it would be worth $175,000 dollars at current values.